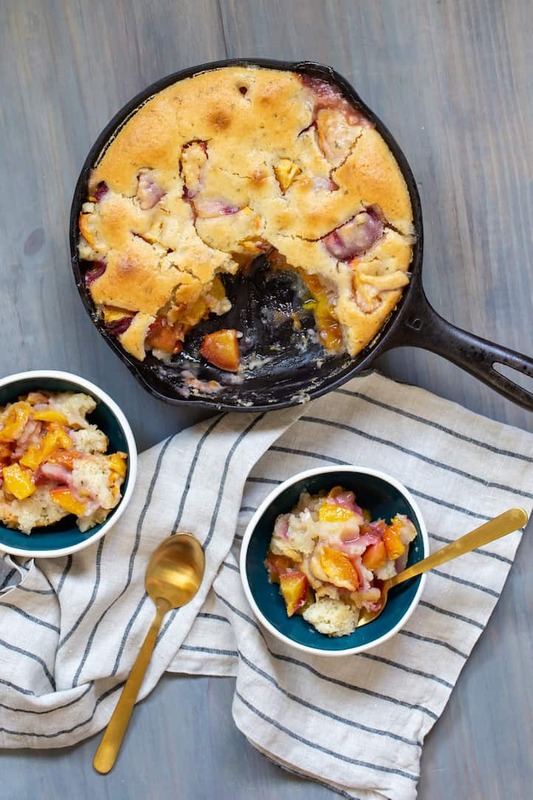 Fresh Peach Cobbler Cake with Rosemary | Good. Food. Stories. Every cook loves unbridled praise for their efforts, but I love a challenge almost as much—and when I get a text like that from my friend LeeMichael, I interpret it as permission to fire on all cylinders. Despite our divergent preferences in wine (mine is for steely, crisp whites and earthy, dusky reds; his is for whatever’s sweetest), when it comes to desserts, we’re simpatico, and he’s a willing test subject for any of my experiments. My return salvo to his challenge? Peach cobbler cake with a hint of fresh rosemary—done dairy-free with nary a hitch—for our annual weekend get-together on the shores of Lake Winnipesaukee. It’s another stellar summer for New Jersey peaches, so the rosemary-spiked recipe was inspired by and adapted from my friend Shaina Olmanson’s excellent book Desserts in Jars, and transformed into a one-pan presentation that becomes a true showcase for the sunny sweetness of the peaches. Instead of a crunchy, browned crumble topping or a thick, biscuity dumpling crust, this version features a pourable cake batter, almost like pancake or waffle batter in its consistency. 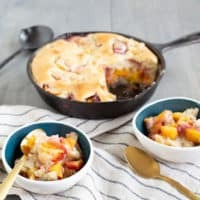 It sinks down and between each chunk of fruit for the best of both worlds: a cobbler that’s part cake with a puffy top crust and edges and part spoonable fruit dessert with a tender, soft center. I keep the amount of sugar in the filling to a minimum so the peach flavor can really shine through—too much, and I feel like it tastes like everyday pie filling instead of a way to show off the fresh fruit. If your peaches aren’t exquisitely perfect this year, you can add one or two more tablespoons of sugar to boost it a bit more. 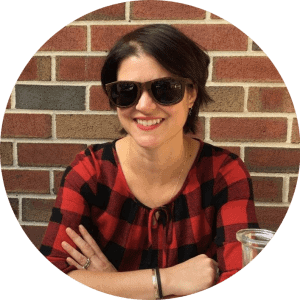 And yes, all you need to do is swap out the butter and milk for non-dairy options, and you’ll have a dairy-free peach cobbler cake that doesn’t exclude your most appreciative audience. If you’re friends with LeeMichael, that is. A peach cobbler cake with fresh rosemary combines the best of summer desserts: a cobbler with a puffy top crust and a tender, soft center. 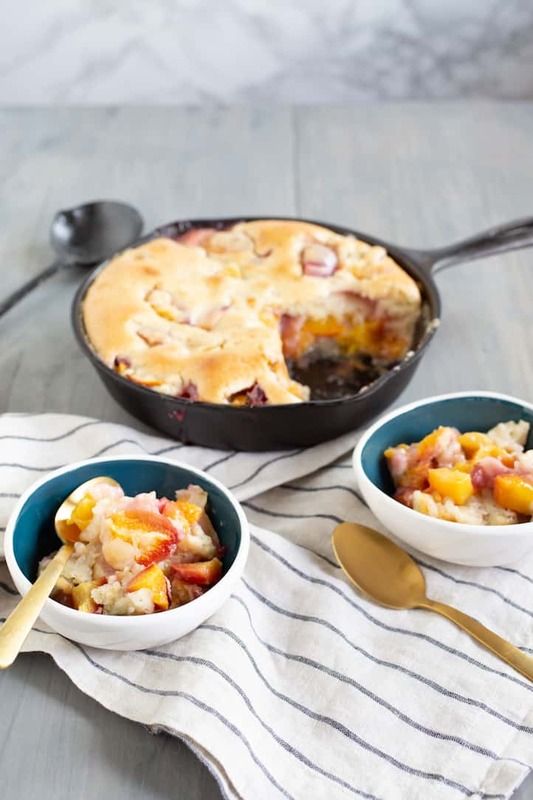 Preheat an oven or toaster oven to 350 degrees F.
Make the filling: pit the peaches and cut into large chunks—small enough to be able to eat in a spoonful, but big enough to let the texture of the peach come through in the finished dish. In a large bowl, stir the peaches, lemon zest and juice, brown sugar, cornstarch, and salt together until the peaches are evenly coated. In a separate bowl, make the batter: whisk the flour, granulated sugar, baking powder, salt, and rosemary together until blended. With a silicone spatula, gently stir the milk into the dry ingredients, then stir in the butter just until blended. 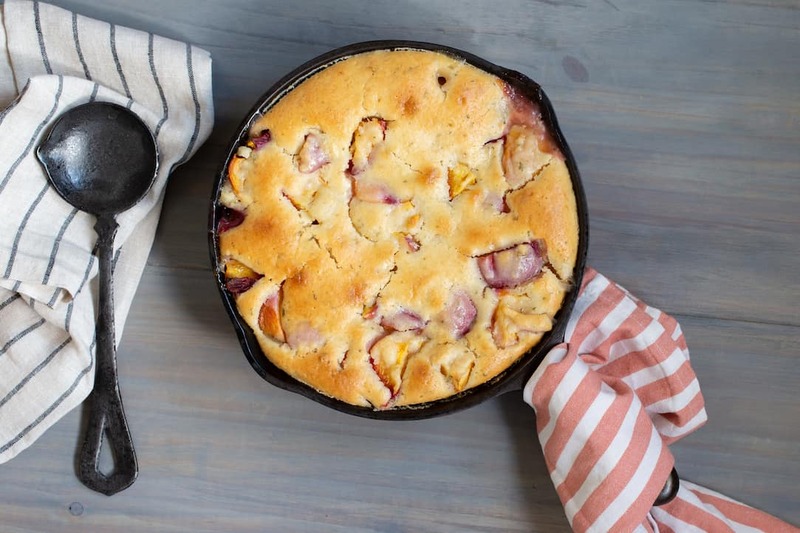 Pour the peach filling into a 9-inch cast iron skillet, cake pan, deep dish pie pan, or deep casserole dish (basically, anything that will fit the peaches comfortably with at least 2 inches of headroom for the topping to puff up when baked). Make sure to scrape all the extra liquid from the bowl into the pan. Pour the batter evenly over the peaches to cover them. Bake for about 1 hour, until the top of the cobbler cake is evenly golden brown and the filling is bubbling at the edges.